Riviera Woman readers who are practicing artists or know someone who is, realise how difficult it is to be recognised. There is the ongoing struggle of where to find serious art galleries to exhibit ones works, obtain media coverage in the press, radio, TV, and online and, finally, sales. There are the practical day to day logistics of painting, studio space, the hazards of painting landscapes outdoors and all the supplementary overheads such as framing, packing, shipping and storage. One looks back with nostalgia to earlier times when artists, it would seem, had an easier time of it, art dealers were tolerably honest characters and one could make a decent living with commissions from portraiture, or official commissions. The more lucky ones like Michelangelo had a wealthy Maecenas like Pope Julius II commissioning his Sistine Chapel frescos or, in more modern times, John Quinn an Irish-American lawyer. This important art collector actively supported many modern avant-garde European painters in their early years. He organised the legendary 1913 Armoury Show in New York that gave international prominence to Picasso and the cubists and the various modernist tendencies then coming out of Europe. He also supported W. B. Yeats, James Joyce, T. S. Eliot and Ezra Pound. There is a golden varnish enveloping those times softening our image of Michelangelo, Raphael, Leonardo da Vinci, Giorgione or Titian’s Italian Renaissance and, later, Frans Hals and Rubens and Vermeer’s aptly named Golden Age of Dutch and Flemish art. This image of European art’s rebirth has a lot to do with the writings of the first real historian of Renaissance art, Giorgio Vasari, (famous for having painted over Leonardo’s ‘Battle of Anghiari’ frescos in Florence) and those eighteen and nineteenth century writers such as Charles Baudelaire who cast a Romantic aura over the period. Present-day scholars of the Renaissance using modern research techniques have now begun to reveal how artists and sculptors of the Renaissance faced much more realistic and difficult circumstances. That Rembrandt’s well documented life, the problems and difficulties he faced are so similar to those of present day artists has for a long time intrigued this writer. When you set it against the lives of other contemporary Renaissance painters, Nicolas Poussin, Claude Lorraine, and even artists much nearer to our own time like Goya and William Blake you are shocked by its contemporary and gritty reality. Rembrandt had to put up with not only the normal professional problems of competition, scrambling for art commissions and chasing up non-paying clients though he was more successful in this than Peter Paul Rubens pursuing, as he did, a policy of requiring payment in advance. He had difficulties of a 21st. 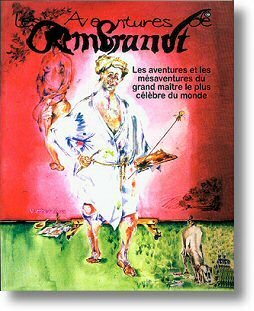 century nature from wives, greedy relatives, mistresses, unpaid debts and the economic difficulties resulting from his Art-Brut style becoming unfashionable not to mention the death of his son. The accumulation of these troubles had a negative influence on his artistic output not unlike those of Pablo Picasso. The ballerina Olga Khokhlova whom he had married in 1918 began divorce proceedings against him in the 1930s. The knowledge that, under French law Picasso was required to pass on to her, half of his wealth, which at the time consisted mostly of his own paintings, so unnerved him that his output declined considerably from then on through the war years. 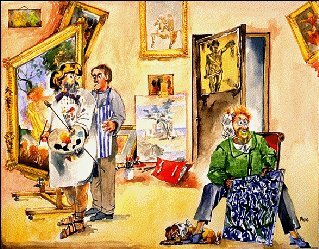 In the ‘Adventures of Rembrandt’ I have tried to depict the satire, humour and misery of the artist’s life, as did William Hogarth in his 1700s. series of paintings of scenes from contemporary life in A Harlot's Progress, The Rake's Progress and Marriage à-la-mode. Hence the subtitle, ‘The adventures and misadventures of the world’s most famous Old Master’. I wanted to record in painting not just the misadventures of Rembrandt’s daily life, but the harshness of life and adverse circumstances of the less privileged artists living today. In 1630 Rembrandt’s etched his self-portrait depicting him as a beggar. 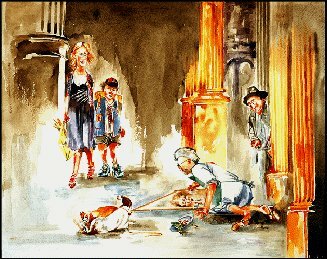 The author depicts him, in this painting, down and out in working-class Dublin and trying to eke out a living as a pavement artist beneath the classical colonnades of Gandon’s ancient Irish House of Parliament. In those post-Depression years, and despite constant showers and drizzle the twelve months of the year, Dublin had a number of well established pavement artists. His school-boy son and elegant wife passing by are bemused at seeing the source of their income. Rembrandt’s attempt to corner the market in Rembrandt etchings brought him financial ruin. Even the forced sale of his unsold paintings and drawings did not realise the massive financial resources he required. 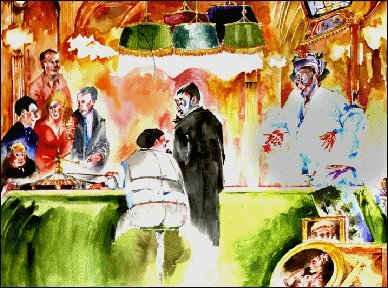 In this scene we find him in the luxurious interior of Monte-Carlo’s legendary Casino. The building, built in 1863, with its fin-de-siècle gold and bronze architecture and gilt stucco reliefs is the work of the architect Charles Garnier, designer of the Paris Opera and numerous churches, private villas and public buildings along the French and Italian Riviera. The rich golden Rembrandt-like tints of the background act as a foil to the green baize of the table and overhead lamps that frame the desperate Rembrandt experiencing another run of bad luck, and his assortment of pictures. In the Adventures of Rembrandt, the artist is frequently accompanied by his two cohorts Toulouse Lautrec and Vincent van Gogh. We meet van Gogh for the first time when he visits Rembrandt in his studio. Vincent has brought along his 1889 canvas, Irises. Alan Bond, the Australian business tycoon, bought Irises at auction for $54 million in 1987, purchased with a loan from Sotheby's, which, (echoes of Rembrandt's life), he was unable to repay because of a change in the financial climate. The painting is now in the Paul Getty Museum. The painting ”That’s the way he would have wanted to go” traditionally is the last of the 50+ Adventures of Rembrandt series but, in fact, was the first one the author created. It shows the artist, snatched away in his prime as he sits outdoors painting a landscape. Ganymede, a.k.a. Rembrandt in ancient Greek mythology was abducted from Mount Ida by Zeus in Phrygia,(now in modern Turkey) in the form of an eagle. Rembrandt’s actual oil painting and the drawing of the same subject are today in Dresden’s Gemäldegalerie Gallery. ‘The Adventures of Rembrandt’ is in French but includes a free English-language PDF version of the book on CD. The book will evoke poignant emotions from artists who read it and for someone who knows one, make an amusing gift.